Please come join me at the Helmut Lang/Refinery29 event at the Saks Fifth Avenue store in Manhattan this Saturday, March 27th, from 2-5pm for a chance to win a $2000 Helmut Lang outfit of your choice! Details: choose from the beautiful Helmut Lang SS'10 collection available on the 5th floor of the Saks NY store and create your ultimate Helmut Lang ensemble. Your looks, made complete by accessories provided at the event by Saks, will then be snapped by refinery29 photographers, and these style shots could end up being posted on refinery29's site to be voted on for a chance to win! 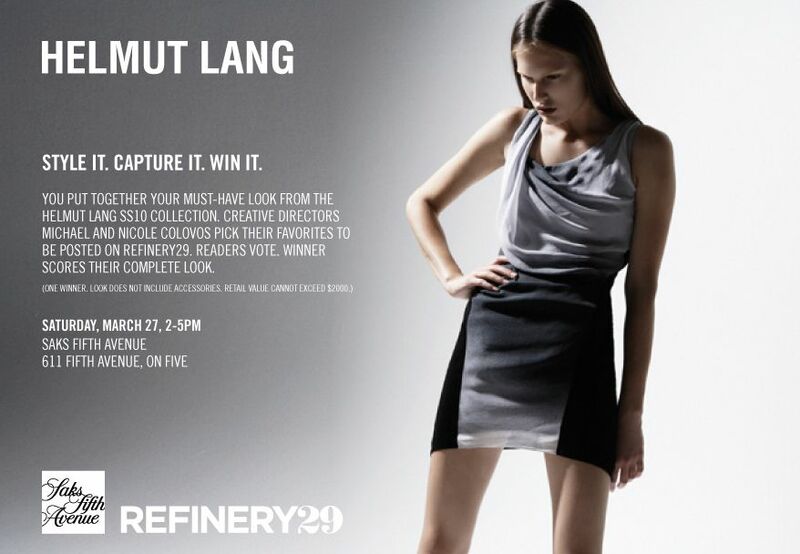 The winner will then receive their photographed helmut lang pieces on the house! You can read more about it here on refinery 29. This is such an exciting event that will be a great way to jump start your spring wardrobe - I hope to see lots of you there!